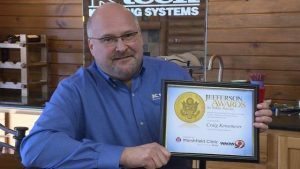 November 29, 2016 – K-tech Kleening Systems, a member company of DKI, North America’s largest disaster restoration contracting organization, is excited to announce President Craig Kersemeier was one of the local Jefferson Award winners honored at the Jefferson Street Inn banquet on Thursday, November 17 in Wausau, WI. The Jefferson Award is a prestigious national recognition to honor achievements and contributions through public and community service throughout America. Its recipients are ordinary people who do extraordinary things without expectation of recognition or reward. Kersemeier won the Jefferson Award on the local level in March 2016 for his efforts through K-tech Charities, which was established in 2006 to give back to the communities in which they serve. He was also chosen to represent North Central Wisconsin in the national awards competition in Washington, D.C. Since its inception, K-tech Charities has distributed over $800,000 in financial aid and countless hours of volunteer services from employees and business partners, including their fundraisers supporting breast cancer patients: Pink Ribbon Open and Cleaning for a Reason. In addition, each year, the group collects and purchases food items for local underserved families during the holidays. In 2015, K-tech Charities and several volunteers distributed over 400 food baskets to prequalified local families in need. To date, this annual volunteer project has resulted in the collection and distribution of eight to ten tons of food annually to Central Wisconsin families. “If you have a group of people together, you are pretty powerful,” Kersemeier added. To learn more about the Jefferson Awards Foundation, please visit www.jeffersonawards.org. Headquartered in Weston, WI, K-tech has been serving Central and Northern Wisconsin customers since 1975. It still thrives today as a 2nd-generation family-owned business with superior commercial and residential cleaning and restoration solution services. Through its K-tech Charities division, conceptualized in 2006, K-tech prides itself in giving back to the community in which it serves. For more information, visit its website at www.k-techkleening.com or www.k-techcharities.com.